If you are looking for a super quick dessert recipe to make, then you can’t go passed a mug cake. They literally take 5 minutes to make. I have made quite a few mug cake recipes in the last few years and today I am sharing my Apple + Cinnamon Mug Cake recipe with you. I decided to make it with banana flour as a different alternative to almond meal or coconut flour and I have to admit that the banana flour works quite well in a mug cake. You can purchase a great quality banana flour from Natural Evolution Foods. 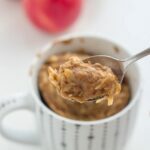 This Apple + Cinnamon Mug Cake is gluten, dairy, nut and refined sugar free. Add the banana flour and baking powder to a large mug or ramekin and mix. Next, add the coconut oil, pure maple syrup, macadamia milk, egg and vanilla extract, mixing well to combine with the dry ingredients. Finally, fold through the grated apple.